On Thursday 7th April, the Council for Independent Education held its annual award ceremony to celebrate the impressive academic achievements of students in each member college. The ceremony is always an auspicious affair, held over afternoon tea in the Cholmondeley Room at the House of Lords, and this year was no different. The room was decorated beautifully and the prizewinning students were accompanied to the tea by proud family and friends; the atmosphere was animated and spirits were high. MPW students had a hard act to follow after our strong performance in 2015 but results this summer were impressive and students scooped seven prizes, five for MPW London and a further two for MPW Birmingham. Lord Lexden presented each student with a certificate to commemorate their achievements and a photographer was on hand to preserve the memories of what is always a fantastic event and a highlight of the MPW calendar. Being in the presence of so many bright and promising young people is always a humbling experience and this year was no different. It was a well-deserved celebration of their talent and success and our sincere congratulations are offered to all of the prizewinners. Full details of MPW London prizewinners are provided below. Jing Jing (Joyce) Fong won the History of Art award. Joyce joined MPW from Malaysia for an 18-month A level course and took up History of Art in September, taking the full A level over a single year. She achieved an A* in addition to her A*A in English Literature and Maths and won a place to read History of Art at University College London. Joyce unfortunately had to return to Malaysia at short notice and is now studying instead at the Malaysian campus of the University of Nottingham. Coco Huggins won the Geography award. Coco joined MPW in September 2014 and took A levels in English and Geography over one year, achieving A*A*. She is currently finishing her A level in German as well as taking Geology A level over one year and an AS level in Economics and is looking forward to studying Geography at Durham University. 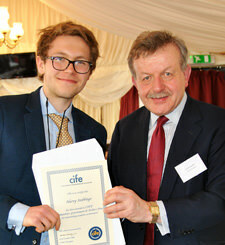 Harry Stebbings won the Government & Politics award. Harry joined MPW for a two-year A level course, achieving grades A*AA in English Literature, History and Politics, including full marks in one History and two Politics modules. Harry is now reading Law at king’s College, London. 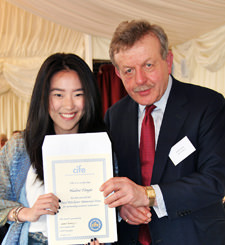 The Paul Kitchener Memorial Award for Outstanding Academic Achievement was awarded to Nadine Tangie who joined MPW from Malaysia for an LSE IFP (International Foundation Programme) course. Nadine was the youngest of all the IFP students and achieved a distinction, the highest IFP grade. In addition, she received a commendation from LSE for gaining the top mark in International Relations among all the students nationally and internationally who sat the examination. Nadine is now studying Politics and Economics at SOAS. 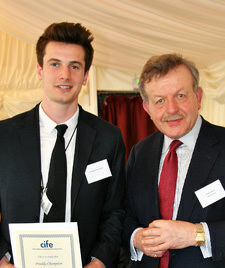 The MPW London College Award was won by Freddy Champion. Freddy took an 18-month A level course at MPW London in Maths, Biology and Chemistry. Prior to joining MPW, Freddy was a professional football player and he used his knowledge and talent to coach the football team through a long unbeaten run, as well as scoring a record number of goals. Freddy achieved AAB in his A levels and is now reading Medicine at the University of Liverpool.